No flower embodies the Christmas season more than the poinsettia (Euphorbia pulcherrima). In fact, no other plant except the Christmas tree comes close to the same popularity this time of year. But why did this flowering plant become so popular? Afterall there are numerous red flowers in nature. Poinsettias were discovered and named by Dr. Joel Roberts Poinsett, an amateur botanist and the first United States ambassador to Mexico. He discovered this beautiful bush growing in Mexico in 1828. He was responsible for importing and popularizing the bush in the United States. One primary reason this plant became popular at Christmas time is because December is the only time of year that poinsettias bloom. Their brilliant red leaves are the perfect color to adorn the Christmas story. Red and green have long been associated with the Christmas season although not always as dominant as today. Poinsettias have been a staple of church decorations in Mexico at Christmas time for hundreds of years. As they spread in popularity in the United States, they easily became a staple of Christmas décor because they are one of few plants that bloom in December, especially in the northern climates. Another reason poinsettias became popular in churches at Christmas time is because to the Aztecs of Mexico the color red represented purity. As Christianity spread in Mexico the poinsettia naturally became a dominate fixture in churches at Christmas time. In the Bible the color white is most often associated with purity. White is clean, and even the slightest bit of impurity is easily seen against a white background. So, it is easy to see why it represents purity. In the Bible red can also represent purity because of the blood of sacrifices. In the key text we see the blood of Jesus’ sacrifice used to symbolically cleans and purify us from sin. Poinsettias are an amazing plant. They can grow into small trees in their native region reaching 12 feet (3.7 m) high with leaves 8 inches (20.3 cm) wide. It is actually their leaves that turn red. Many people mistake the red leaves as flower petals. On most flowering plants the petals have the bright colors. That is not so with poinsettias. The flowers are very small, unremarkable yellow buds at the center of the brightly colored leaves. Poinsettias come in a variety of colors including white, pink, salmon, cream, yellow, and most popular, red. You may see blue or other colors, but these have been dyed. Whenever you look at a poinsettia this Christmas, whether white, red, or some shade in between, remember what Jesus has done for you. Jesus shed his blood so that we could be purified and live with him eternally. Let that be an ever-present thought in your mind when you see a poinsettia. What is your favorite Christmas decoration? Why do you think red and green are the most popular Christmas colors? How does the blood of Jesus make us pure? What are some ways you can help to keep Christ at the center of Christmas this year? 1. Dr. Leonard Perry. 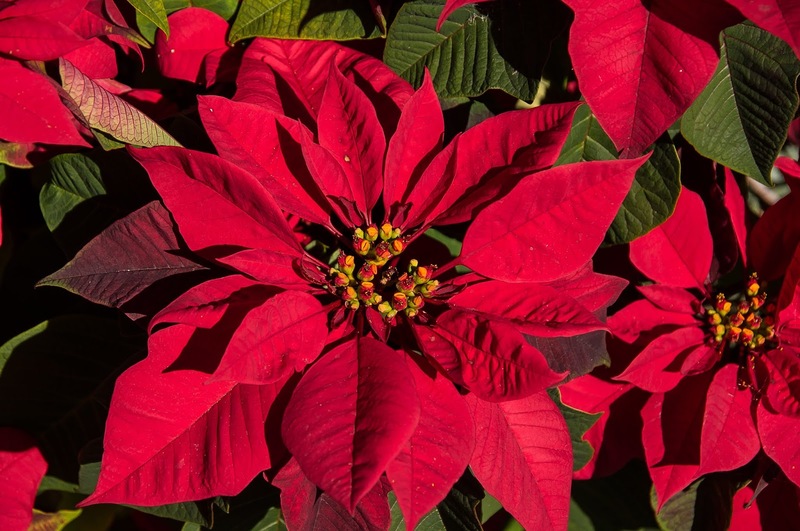 “Fun Facts About Poinsettias,” The Green Mountain Gardener online, (Burlington: University of Vermont Extension Department of Plant and Soil Science) accessed December 3, 2018, https://pss.uvm.edu/ppp/articles/points.htm.